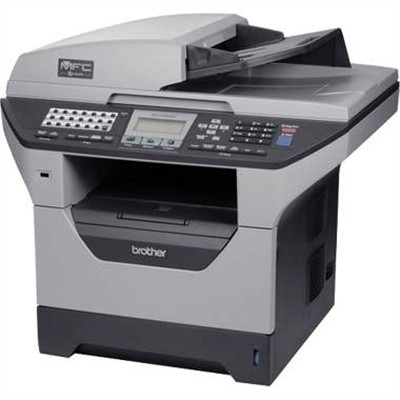 The Brother MFC-8480DN Multifunction Laser Printer offers great value for your business. Its automatic duplex feature for two-sided printing helps save paper and an optional high yield toner cartridge is available to help lower your operating costs. Its legal-size document glass allows for ample room for scanning and copying one document at a time. Use the 50-sheet capacity auto document feeder for copying, scanning or faxing multi-page documents. The Brother MFC 8480DN Multifunction Laser Printer features fast, quailty printing and copying with speeds up to 32ppm. It also has a USB direct interface to print PDF or JPEG files from or scan PDF or JPEG files to your USB flash memory drive. The Brother MFC-8480DN Multifunction Laser Printer also allows you to share its printing on either a wired or wireless network. Consumables are not included with the purchase of the machine. Ships with a power cord only.